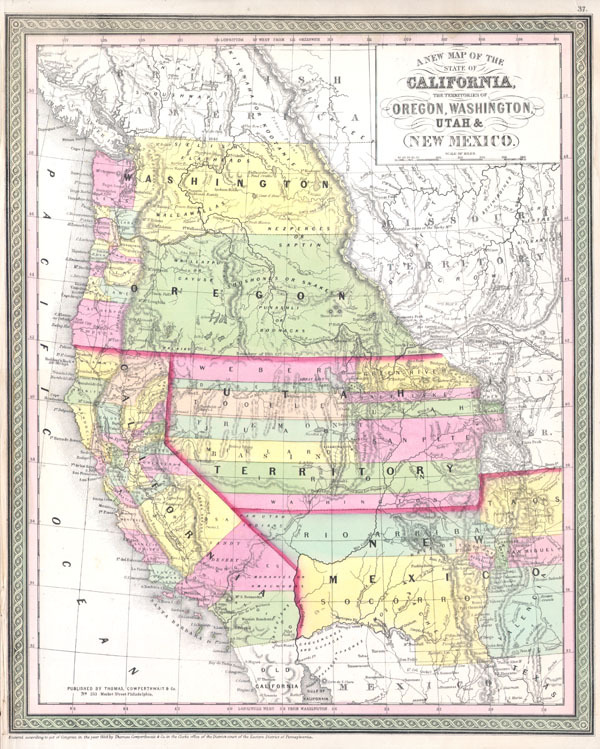 A New Map of the State of California, the Territories of Oregon, Washington, Utah & New Mexico. An extremely important 1853 map of the western United States by S. A. Mitchell Sr. Based upon Mitchell's own seminal 1846 Map of Texas and California. Depicts the United States west of the Rocky Mountains and predates the Gadsden Purchase. Tucson (Tueson) is located firmly in Mexico. 'Vegas' appears in an embryonic form. Lake Tahoe is not present, and Tule Lake is mistakenly enlarged. Also notes many of the important routes of the western Migration including, the Spanish Trail from Los Angeles to Santa Fe., Lt. Col. Cooke's Wagon Trail, Kearney's Route along the Rio Gila. Provides accurate and semi-accurate references to forts and Indian Tribes, especially in the southwest and in the Washington / Oregon Territories. Much of the cartography of the Great Basin is conjectural at best, but there are references to Fremont's Explorations. Indicates several alternative Mexico – US borders including those suggested by Bartlett and by Graham. Dated and copyrighted: 'Entered according to act of Congress in the Year of 1853 by Thomas Copwerthwait & Co. in the Clerk's Office of the District Court of the Eastern District of Pennsylvania. Fine or perfect condition. Minor staining in right margin. Left margin narrow, as issued. Blank on verso. Cf Moffat, R.M. Printed maps of Utah to 1900, 42. ; Phillips, 823.; Rumsey, 2832.001, 3802.001. Wheat, C.I. Maps of the Calif. gold region, 168; Wheat, C.I. Mapping the transmississippi West, 684.